Several British comics have been known to be named after ferocious beasts; Eagle, Lion, Tiger, Jag.... er, Butterfly!? Yes, Butterfly seems to have been an unusual title for a comic but it didn't harm its fortunes, with it running 1,206 issues from 1925 to 1940. The issue shown here is No.1,101, dated May 14th 1938, but published on May 10th, 76 years ago today. The topline announces "Grand News For All Readers", but this wasn't the sort of "grand news" that often meant a merger. It was simply an announcement of a new story due to start the following week. 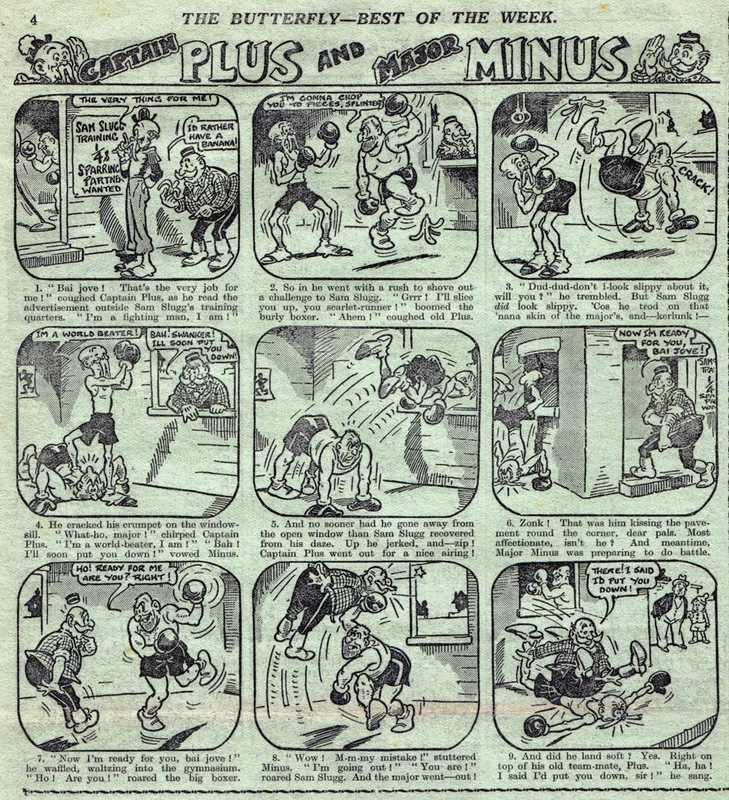 The cover strip, Smiler and Smudge, was drawn by Bertie Brown. Unfortunately, reflecting the times, 'Smudge' is presented as a stereotypical caricature of a black boy both in appearance and speech. He's also subservient to his white co-stars. Although Smiler and Smudge are pals, it's clear who's the boss. It's a nice example of Bertie Brown's artwork but there's little else to recommend it. Moggie the Mouser. Originally by Roy Wilson but I don't think this episode is. It's interesting that the character was created in 1936, pre-dating The Dandy's Korky the Cat by a year. On page six, a typical A.P. 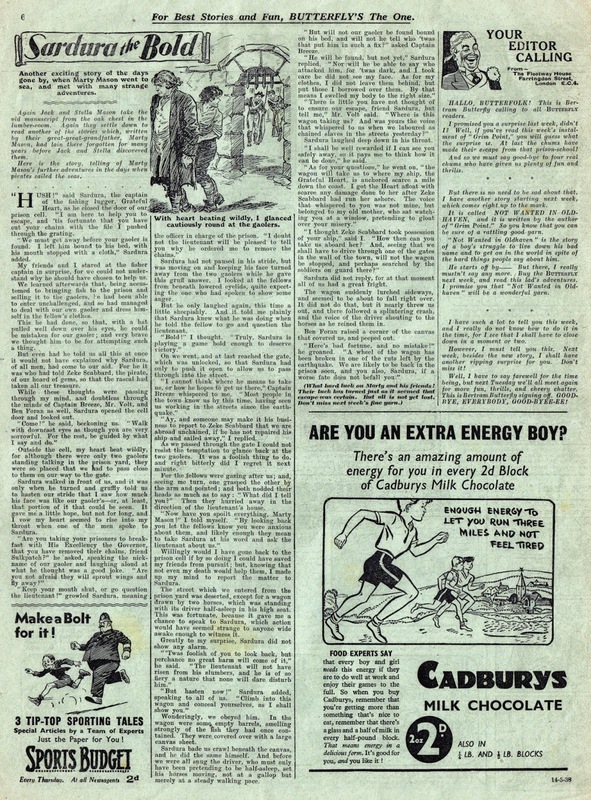 text story, Sardura the Bold, sharing the page with the editor's letter, an advert for Sports Budget story paper, and an ad claiming that a bar of Cadbury's chocolate will give you "enough energy to let you run three miles and not feel tired"! What a huge difference to today, where chocolate is no longer allowed to be advertised in comics because it causes obesity! On the back page, the only adventure strip in the comic; Jungle Island. (I don't recognise the artist, sorry.) Serials featuring British characters a faraway setting were the norm in comics of the time so each story needed its own novelty. In this case, it's Banjo Joe, who seems to have an annoying knack of strumming his banjo during life or death situations. No doubt the plucky musical instrument saves the day at some point. ...and that's another look back at a comic from bygone years. Please let me know in the comments below if you enjoy looking back at these pre-war titles. I know a lot of comic fans prefer the titles of their own childhoods, but I think it's important to make sure the history of British comics, for better or worse, isn't forgotten. What do you think? also great seeing the cartoon cats and you right they do look like Korky.. I like seeing comics from the long distant past..
Much appreciated - my grandad mentioned this comic as one of his favourites, in a chat I had with him before he passed away. 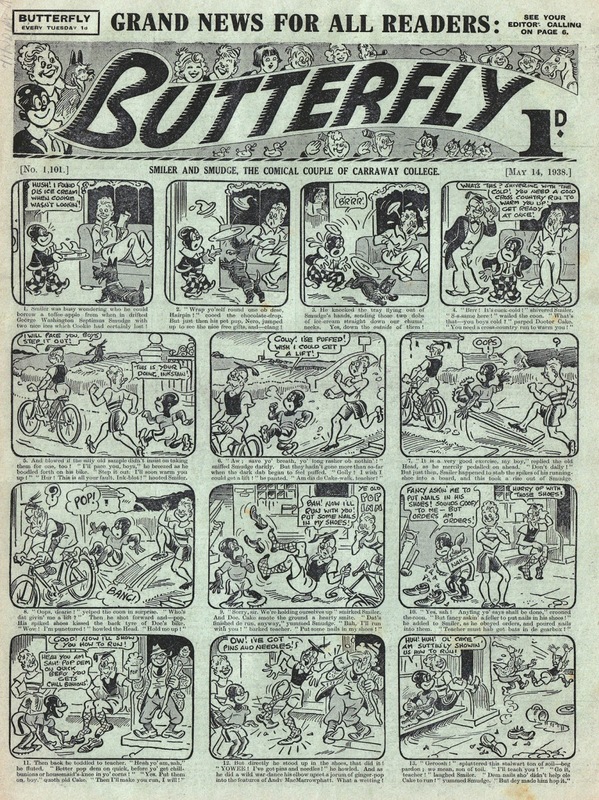 I've always been intrigued by a boy's comic called 'Butterfly'! I tend to prefer the adventure stuff, Lew- from any era, but I appreciate seeing these pre-war humour titles now and then. I visit here for the variety- and the fact that I never know what era or genre I'm going to see! Personally, Lew, I love seeing them all. Please keep on showing us them. Anon, I think this was aimed at boys and girls, but it is a strange title for a comic all the same. I breeze through these posts but the 1930's is well before my time so obviously I never read the strips. Some comics from my childhood please Lou. Thunder, Warlord, Battle? Maybe Lion ?. I have covered some of those comics, Stephen. Try the search window and you should find some posts. Just curious: Why do you choose not to read strips from before your time? I presume you listen to music, or watch films, from outside of your nostalgia zone? It's entirely up to you of course, but anything that expands our comics enthusiasm is good, yes? I really enjoy your sharing these old comics. I'm curious about the period and without your posts I'd never have seen any of these titles. Though the humor strips are interesting I'm most attracted to the adventure strips. Some nice artwork on "Jungle Island," but I have to admit Banjo Joe is a bit much. If I'd been plagued by some guy strumming "Happy Days Are Here Again" while I was fleeing murderous natives I'm afraid I'd have tossed him into the Lake of Fire. Fantastic stuff Lew. I'm afraid I can't identify any more of the artists, though I agree that Moggie the Mouser doesn't look like Roy Wilson's work. 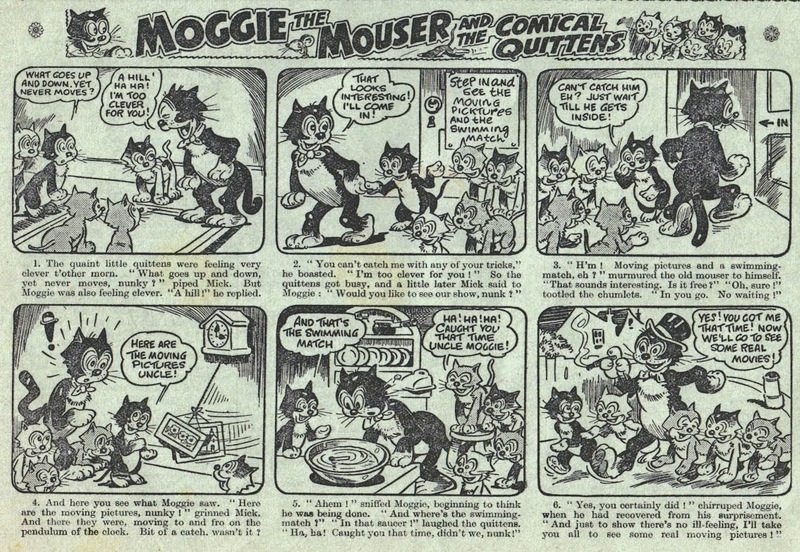 I wonder if Moggie was any relation to Bertie Brown's Moonlight Moggie who appeared in Jester and then Chips for many years. I'd love to know who drew Jungle Island as the artwork seems surprisingly effective for the period - almost the sort of thing Wilson himself might have produced if he'd become a 'straight' adventure artist. I must confess that when I was younger I had little interest in comics published before I was born - to the extent that I couldn't understand Alan Clark or Denis Gifford's enthusiasm for them. The older I get, however, the further back my interest seems to extend, so that nowadays I'm much more at home with Wilson and Brown than with anybody who finds himself endlessly churning out superheroes for the Yankee Dollar! It's good to hear you appreciate the older material now Phil. I've been fascinated by the history of comics since I was a child (reading Fantasy Masterpieces' Captain America reprints of the 1940s, and The Penguin Book of Comics). Also, as I've said before, my grandad told me that he used to read Chips around 1900 or so, and that piqued my curiosity about comics from the past. 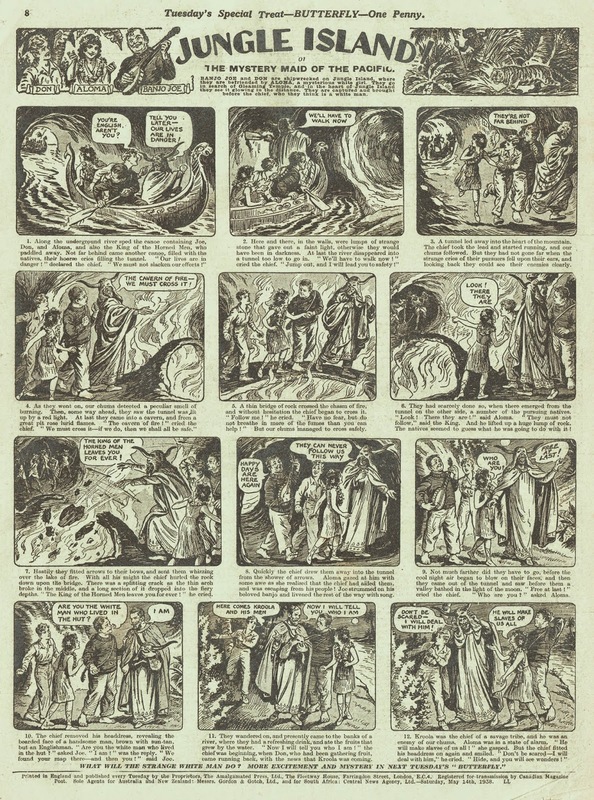 Admittedly not everyone shares that view, otherwise Fantasy Masterpieces wouldn't have ended after a few years and Denis Gifford's 'Penny Comics of the 1930s' facsimiles would have continued as planned beyond the first collection. My main incentive in showing these pre-war comics is to counteract the myth that traditional British comics began with The Dandy. It's not something DC Thomson have ever claimed, as far as I know, but somewhere along the paths of time this error has crept in. The pioneering work of Tom Browne, Don Newhouse, Roy Wilson and co shouldn't be written out of history. Funnily enough I've just been to see the current 'Comics Unmasked' exhibition at the British Library and, while it has much to recommend it (including vintage material like 'Police News' and 'Ally Sloper's Half Holiday'), I was rather startled to discover that comics from the 1920s and 1930s seem to have been almost totally ignored - as if they were considered too 'conventional' to bother with. Personally I'd have thought that something like 'Casey Court' would have fitted the theme quite well. They probably are considered too conventional for the theme of subversiveness in the exhibition. It's a shame though. There were a lot of strips in the 20s/30s about the underdog winning the day, which I thought might have fit, but perhaps not. I haven't seen the exhibition myself yet. I love the old comics. A lifelong comic reader, I never knew anything whatsoever about these comics until recently. But they are beautifully drawn, and many are extremely well written. 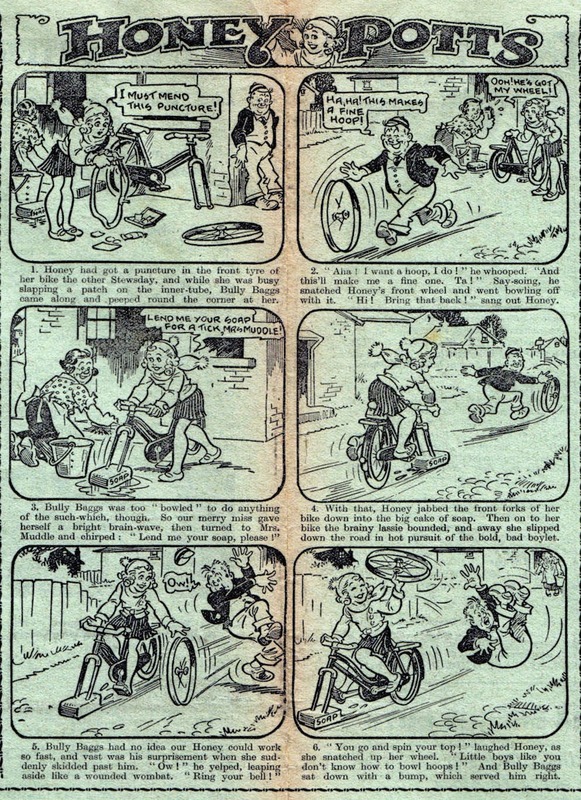 Looking at old issues of Funny Wonder, Jester and Illustrated Chips, they would seem to indicate that working class children of the first half of the 20th century were very strong readers. The humour is also decidedly Wodehouseian in some of the better strips. Well you can see why The Beano and Dandy were so successful, with slightly less 'jolly' artwork this could easily be from 1910! Apparently one of the first "sophisticated" British advenure strips was The Golden Arrow, which appeared in Puck in 1937, a look at that would be interesting, though from my occasional Ebay searches I think Puck and The Butterfly are both very rare! Yes, admittedly the A.P. comics were stuck in a rut by the end of the thirties. They do have a certain charm about them though, but it's good that Dandy and Beano shook things up. A.P. responded with Radio Fun and Knockout, which were a bit fresher than the tabloid comics. I don't think I have a copy of Puck, but The Golden Arrow sounds familiar so I'm sure I've seen it somewhere. I found a Butterfly annual from 1939 for a pound! I assume it was the only one if they folded in 1940? Great find! There was another one, dated 1940. Remember that annuals are dated a year ahead of publication.